This blog is about all my other crafts projects: doll clothes, dollhouses, paper models, sewing, knitting, crocheting, card weaving and whatever else I might try. As the cartridges for my old color printer would have cost more than an entirely new machine, I bought a HP Deskjet 1050 all-in-one. It replaced not only my old printer, but also the scanner. 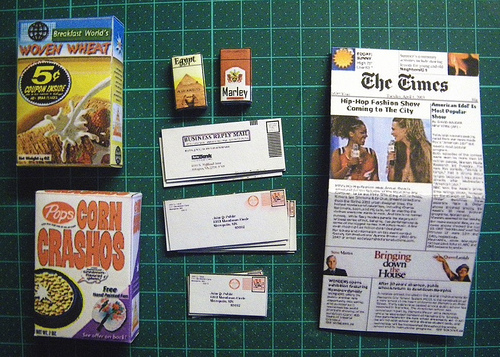 Among the first items I made with it are these 1:6 scale printables from Jim's Printable Minis. I also wanted to test the new scanner, so I scanned some of my magazines for 1:6 scale. Vogue had a black back cover, so I didn't scan it, but the others have the back cover as well. 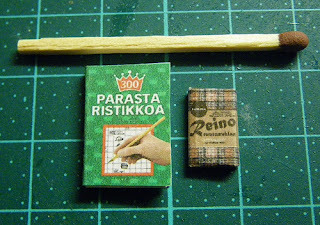 I also scanned my crossword book and a cardboard package of chocolate and resized them to 1:12 scale. I made a miniature version of Thomas Malory's "Le Morte d'Arthur" with Aubrey Beardsley's illustrations. I made a smaller version first as it didn't need as many inside pages as the 1:6 scale version. 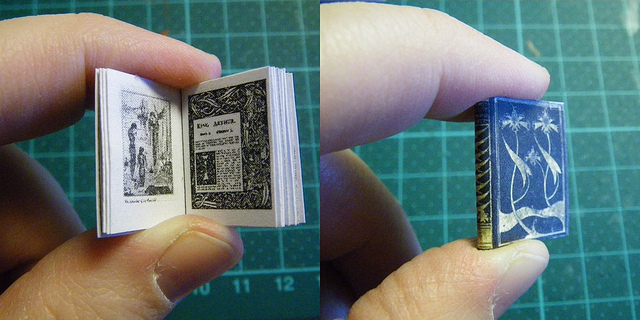 The miniature version has a few pages from the beginning of the book, selected by how they would look in small scale, and about dozen pages starting from the first page of Chapter 1, which is the right side page here. The inside pages are black and white (except the left side page here, which is grayscale), so I printed them with a laser printer on regular copy paper. Laser printer meant there was no need for fixative for these pages. The cover was printed on cardstock. It looks a bit worn as I scanned the separate paper cover rather than the covers of the book. The book is so big that it was easier this way. The light parts of the cover are gold colored and that doesn't seem to print very well. I have asked the current copyright holder, Random House UK, for a permission to make the files for this miniature book available for others. If I get the permission, the files will become available on my web site at some point.